US Stock - 110V 51" x 35" 1390 CO2 Laser Cutter, with Reci W4 Laser (100-130W) and Electric Lift Table. We have showroom in California, L ocal pick-up is available! 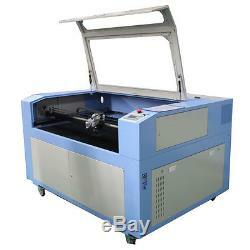 51" x 35" (1300mm x 900mm) Ving Laser Cutter, with Reci W4 Laser and Electric Lifting Worktable. To be used to: This 1390 Ving brand co2 laser cutting engraving machine is applied in advertising industry, decoration industry, handicrafts, paper, packaging industry, etc. This machine can process nonmetal materials such as acrylic, MDF, plywood, paper, plastic, fabric, leather, rubber, ceramic, tile, glass, marble and so on. Working Area: 51" x 35" (1300mm x 900mm). Laser Power: Reci W4 CO2 glass laser tube 100W-130W (Normal lifespan: about 10000 working hours). Working Table: Blade + Honeycomb. Cooling Type: CW5000 water cooling and system. Supported Graphic Formats: BMP, HPGL, PLT, DST, AI. Control Software: DSP control system. Compatible Software: CorelDraw, AutoCAD, Photoshop. Working Voltage: AC 110±10%, 60Hz. Working Humidity: 5% - 95%. 1300mm x 900mm (51" x 35"). 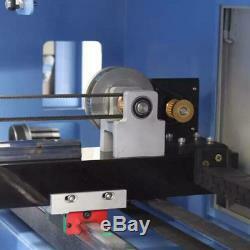 Reci W4 CO2 glass laser tube 100W-130W (Normal lifespan: about 10000 working hours). Sealed Co2 glass laser tube. CW5000, Water cooling and protection system. Letter 0.5mm, Chinese 0.5mm. AC 110±10%, 60Hz or depend on customer. Details: Laser head with red dot. Rotary Fixture(Optional) Feature: This series CO2 laser cutting machines adopt DSP digital controlling technology, self-design laser power supply, incorporate designed frame and structure to guarantee stable work. The newest software is matched to AutoCAD, CorelDraw, CAD and all other graphics processing software for outputting original graphics. 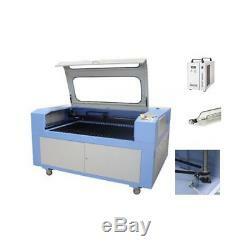 This series laser cutter firstly use USB port data interface which supports hot-plugging and momentary data transmission to realize high efficiency without accounting computer resource. The LCD controlling panel brings friendly computer-human interface and easy operation. The most advanced DSP controlling technology developed firstly in this field offers functions of successive, rapid and curved cutting, optimization of shortest processing path to create high efficiency. Compensation of luminance decrease is made automatically in the course of engraving to keep identical cutting in different areas. Production efficiency is greatly imported through using rapid controlling software for cutting and buffering function in high speed movement. Professional accessories suitable for various processing such as aluminum alloy honecomb bottom board of different bore diameters made of aluminum alloy, metal columns of different intervals and negative pressure adsorption device for soft materials can be provided according to customers demands and materials, which realizes design and processing on-the-spot. Advanced color management supports any color and defines engraving sequence freely to realize one time or whole output. It uses USB port date interface with large mass storage device to provide high working speed and efficiency. Include: Laser tube assembly; Water chiller installation; Air pump connection; Exhaust fan installation; Grounding wire connection. Software and USB driver Installation. 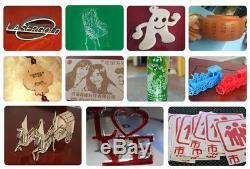 Software Operation Edit the images in the engraving software or input the color pictures into the engraving software, edit it, and then set the processing parameters, output images to our laser cutting machine, finish the work. Application: Applicable Industries: Garment, leather, cloth toys, computer embroidery cutting, mold, crafts, bamboo and wood, advertising and building decoration, packaging and printing, paper products, etc. Applicable Materials: Rubber, plastic, cloth, leather, woolens, crytal, organic glass, tile, jade, bamboo and wooden products, etc. Lead Time: After receiving customer's deposit, within 2 - 5 days. Wooden Box: There is total one wooden box. 72" x 52" x 43 (1830mm x 1330mm x 1100mm). 76x 56 x 45 (1920mm x 1430mm x 1150mm). 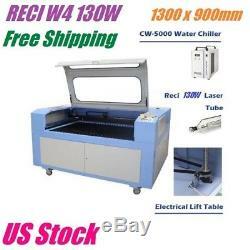 The item "RECI W4 130W CO2 Laser Engraver Cutter 1300 x 900mm Wood Engraving Cutting USB" is in sale since Monday, September 17, 2018. This item is in the category "Business & Industrial\Printing & Graphic Arts\Screen & Specialty Printing\Engraving". 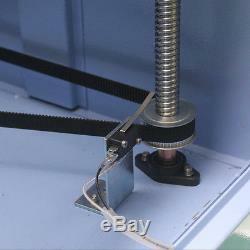 The seller is "ving-store" and is located in Cerritos, California. This item can be shipped to United States, Canada, Mexico.